The Accu-Set Plus SMART (closed-loop) potentiometer is a compact, microprocessor-based unit capable of being either field or factory configured for a number of industry’s motion control needs. The Accu-Set Plus is designed around a velocity form PID algorithm, and provides a DC “speedpot” signal to an external drive. A flexible Open-Loop mode is also available for applications where using a speed pickup isn’t practical or desired. 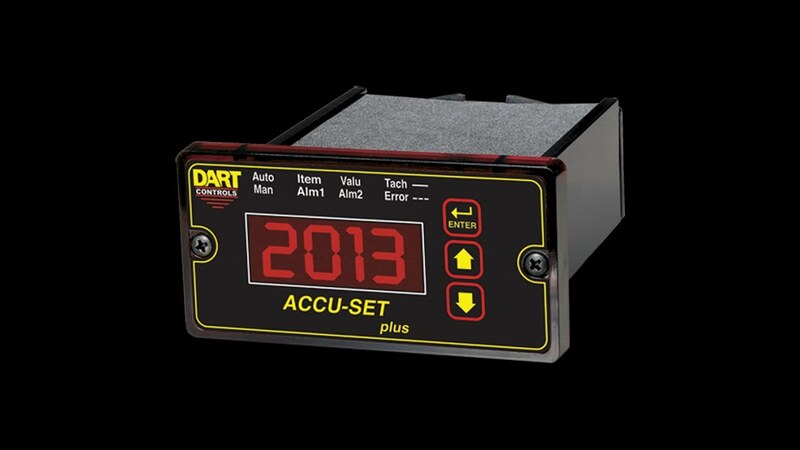 The Accu-Set Plus is easily configured to operate as a digital speed controller, time-based process controller, or a ratiometric follower controller in master-slave systems. Featuring Dart’s new ModularBus expansion slot architecture, the Accu-Set Plus is ideal for volume OEM Adjustable Speed Control applications requiring specialized inputs and outputs, such as our OPT420 optically-isolated 4-20mA I/O card that comes factory-installed in the ASP40-420. Contact Dart Controls’ Sales Department for details. The Accu-Set Plus is ideal for applications such as Water and Waste Treatment Systems, Conveyor Oven Controllers and Synchronized Conveyor Lines, to name a few. The NEW -51 Option adds serial communication capability to the ASP Plus. RS232 and RS485 protocols are supported. The ASP40’s Durable 1/8 DIN NEMA 4/4X aluminum housings can be easily mounted in a panel or control cabinet. The new optional pluggable terminal block allows the user to quickly install or replace units without the hassle of physically removing and reattaching wires. The units can be ordered with either the standard European-style 5mm terminal block or the optional “pluggable” connector. *Shipped set for 0-3600 RPM with one pulse per revolution. These closed loop devices require an encoder / speed pick-up. The Dart PU-E is an excellent choice!